Evacuation chair training – a legal requirement? The Disability Discrimination Act (DDA) 1995 recognises the importance to ensure all occupants, including occupants with disabilities, have reasonable access throughout a building, and places duties on all those that provide services to the public to make changes for disabled access where needed. These adjustments need to ensure that no person is at a disadvantage and requires the responsible person to provide a means of escape for everyone, including those with a disability. In an emergency, lifts can usually not be used for evacuation, so stairs become the main escape route from the premises. For physically disabled people this can be a problem. In this situation evacuation chairs have to be considered in your evacuation planning. They offer safe evacuation for any people unable to use stairs. For evacuation to lower floor levels the chairs are usually operated by just one person. However, there are a range of evacuation chairs available, including chairs for evacuation to higher floors, on the market and Safelincs, as an approved partner of evacuation chairs from UK manufacturer Evac+Chair, is able to provide all of these. Please visit our website to see the full range of Evac+Chair models and accessories available. Once you have chosen an evacuation chair as part of your escape route plan, do you need to provide training for your employees? According to the Provision and Use of Work Equipment Regulations (PUWER) 1998, equipment provided for use at work needs to be “used only by people who have received adequate information, instruction and training.” This means that the employer, building owner, or the responsible person is to ensure all appointed employees (those responsible to use equipment in an emergency) receive adequate training as to the correct use of the equipment. By simply installing evacuation equipment alone you have not necessarily satisfied your requirements as the responsible person. Should you have to renew your fire risk assessment, checks will normally be carried out as to whether training has been given for all the fire safety equipment located in the workplace. If an evacuation chair has been installed but no training has been provided for your employees, this would be seen as a non-compliance and risk by the assessor. When choosing an evacuation chair training course, ensure your employees receive comprehensive theoretical and practical training from a fully qualified and experienced trainer. At Safelincs, we offer nationwide on-site evacuation chair training, suitable for up to 6 participants per course and completed on a time and date to suit you. For more information regarding our evacuation chair training, please visit: https://www.safelincs.co.uk/evacuation-chair-training/ or call our friendly customer services team on 0800 612 6537. Under current legislation, it is the responsibility of the employer or building operator to ensure that their business complies with fire safety, health and safety and equal opportunity requirements. If you employ mobility impaired persons, the responsibility of ensuring their safe escape from a multi-storey building in the event of an emergency, for example fire, can be daunting. The use of lifts in an emergency is usually not permitted and the escape route will therefore be over stairs. There are a number of evacuation solutions available in this situation. Safelincs offers a wide range of emergency evacuation chairs to match different types of stairs and gradients. All of the chairs have the ability to descend flights of stairs with ease, ensuring a smooth and stress-free emergency escape for the passenger. For the the Evac+Chair 300H MK4, 500, and 600H evacuation chairs, this is achieved through the use of specially designed friction belts. Taking into account the distribution of the chair’s weight and load, the friction belts ensure that the chair does not slip or accelerate too rapidly during stair descent. When the passenger has reached level ground, the operator simply deploys the back wheels and pushes the chair to the safe assembly point. The Evac+Chair 300H MK4, 500 and 600H emergency evacuation chairs have a number of features to provide comfort and support to the user. The “sling style” seat combined with the forehead restraint and safety buckles allow for the passenger to sit back in the chair without the worry of being tipped forward during descent down a flight of stairs. The material of the sling seat is padded, ensuring user comfort. For some mobility impaired persons, the movement from a wheelchair to a sling style seat can prove a difficult task. The Evac+Chair comfy seat has been designed to clip easily on to the 300H MK4, 440 and 600H evacuation chairs, which provides a flat surface ideal for stability and support when mounting the evacuation chair. The Evac+Chair comfy seat can be purchased as a retrofit. Other evacuation chair accessories available are the Evac+Chair stand and storage cabinet. These products are designed for use with the 300H MK4 emergency evacuation chair and are suitable for internal use. The evacuation chair stand is ideal in locations where wall mounting is not an option. The evacuation chair storage cabinet is a popular accessory used in schools, prisons and other applications where tampering may be an issue. The cabinet is fitted with a secure key lock and can either be wall mounted or left free-standing. Both the stand and the storage cabinet, paired with the photoluminescent sign, help to highlight the location of the emergency evacuation chair to all occupants of the building. They also help to deter unauthorised movement from the chair’s strategically placed position. Since the introduction of the original Evac+Chair 300H MK4 emergency evacuation chair, the manufacturers evolved the chair’s features and produced three more chairs to suit the needs of different buildings and users. The 500 emergency evacuation chair has the ability to cope with a higher passenger payload of 440lbs/200kg, meaning that the chair can cater for a heavier person. The specially designed friction belts have also been developed so that it is suitable for use on regular and steep 45° stairs. The 600H evacuation chair carries the traditional benefits of the 300H MK4 model, with the addition of two extra handles suitable for up to 4 operators as needed in the event of emergency. The inclusion of two additional handles means that the 600H chair can be used for escape locations with difficult access i.e. unmoveable obstructions, so that the passenger and chair can be lifted until the evacuation stairway is reached. As well as for use at locations with difficult access, the 600H evacuation chair is typically installed where you may need to go up flights of stairs for escape e.g. from basement level. The additional handles allow for the mobility impaired person to be carried, until the wheels and/or motion friction belts can be used again. Finally, Evac+Chair has produced the IBEX TranSeat 700H evacuation chair designed to ascend as well as descend stairs. The IBEX TranSeat has a top extendible handle, and the load bearing tracks mean that no heavy lifting is required on stairway ascent. During ascent, the operators release the brake that may have been previously set for descent, so that they do not experience any restrictions when moving the passenger up the stairs. It is important that operators are aware of the correct handling of any emergency evacuation chair to ensure the safety of the passenger and to avoid any injury or strain during use. 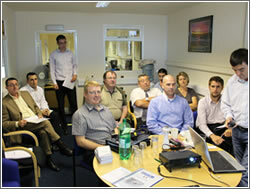 Safelincs offers on site evacuation chair training, carried out by experienced and professionally qualified trainers. The certificated course includes both theoretical and practical training tasks and is available for a maximum number of 6 participants per session. You can book the evacuation chair training online or call our dedicated customer service team on 0800 612 6537. Nothing is better than first hand experience when it comes to inspiring young minds to envision their future in a field of business. With this in mind, Safelincs MD, Harry Dewick-Eisele did a presentation to year 10 Business Studies at our local Grammar School. The topic was e-commerce – ‘Benefits and Drawbacks’. Safelincs see these interactions as an important part of supporting the local community but also as part of the solution to the lack of specialist web design and web development skills needed for our industry. Following a similar presentation a few weeks ago, one of the students on the IT Diploma course at the same Grammar school started a longer term placement with Safelincs. He will design an entire website aimed at building a brand for a new range of fire extinguishers introduced by Safelincs. These fire extinguishers will be Ultrafire branded and will come in two distinctive lines (Ultrafire blackline and Ultrafire redline).